Boutonnière deformity describes a posture of the finger in which the middle joint is bent down and the end joint is bent back. The usual cause is a stubbing injury of the finger, but the deformity can also be due to arthritis. 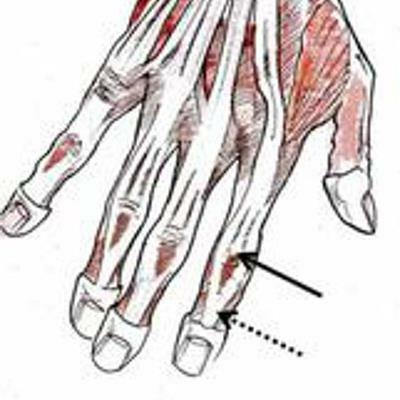 In the normal finger, the straightening forces in the tendons are balanced between the central slip (solid arrow) and the terminal tendon (dotted arrow). If the central slip is torn by injury it can no longer straighten the middle joint, which drops into a bent position. The straightening force is now all transferred to the terminal tendon, which pulls the end joint up and it then becomes difficult to bend the end of the finger fully into the palm. The same posture can develop if the central slip is injured by a cut on the back of the middle joint. • Inability to actively straighten the middle joint of the finger. It can be hard to distinguish this injury from the much more common middle joint sprains, as both injuries cause pain, swelling and stiffness, and the characteristic deformity may not appear for some days or weeks after the injury. An x-ray should be taken to look for a fracture and check the joint is in place. Occasionally an ultrasound scan may be required. If the injury is caused by a cut, the tendon can be repaired. Stubbing injuries are usually treated by splintage. A splint will be applied to keep the finger in a straight position at the middle joint and will usually allow the end joint to bend. Several types of splint are available. A splint is normally worn for between four and eight weeks. Use of the splint is usually monitored by a hand therapist, as using it correctly is important for good healing of the tendon. The majority of injuries treated by splintage will heal leaving satisfactory function of the finger, though this can take several months to regain maximal function. In some cases the finger does not recover full movement, and lacks full straightening at the middle joint and/or limited bending at the end joint. Occasionally the tendon fails to repair itself. It can be treated by a further period of splintage and if this fails there are surgical options that can be discussed with your hand surgeon.